Do you know all of the elements that go into birding? Keywords like Habitat, Migration, and Travel join birding legends RTP, Sibley and others along with reminders of unlucky moments like Flat Tire, Lost Binoculars, and Sunstroke. These and more fill in this colorful Periodic Table, where the elemental abbreviations are universal but the names are all about birdwatching! 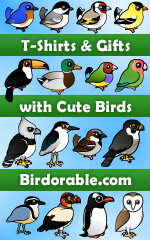 This cute colorful design is great for anyone that loves the hobby of birding. To order by phone, call toll-free at 1-877-809-1659 from Monday - Saturday 9:00am - 9:00pm EST. You'll need to note the Product Number 030-1317727645 to make your order.